Coughing, Sniffles, and Fever… OH MY!!! Its that time of the year again when people start to feel under the weather and worry about catching the new virus that is going around. Its Flu Season!! Everyone is running to their doctor or to the nearest drug store to get their flu vaccination. Every other commercial or ad on the billboards tells us to hurry and get there discounted or even FREE flu vaccine. The past few years I was right there in the midst of all the panic rushing to get my flu vaccine so I didn’t catch that horrid flu. But is the flu vaccine really helpful? How effective is this so called vaccine that is the “prevention” for the flu? Is getting the flu worse than the possible side effects that comes from the flu vaccine? All these questions come to my mind now that I have learned more about the flu vaccine from its effectiveness to its horrible side effects. According to the CDC the flu vaccine used to be 70-90% effective, but the CDC has recently released that the vaccine is no decreased to being only 50-70% effective to preventing the flu. That is a great decrease in effectiveness on a prevention that the media has pushed for its importance and the key to keeping the flu away. On top of the effectiveness making a significant decrease. Have you asked yourself what is in this vaccine that we are all so easily getting injected into our body. These ingredients are surprisingly more dangerous to our bodies over time than catching the flu virus. According to Dr. Hugh Fundenberg getting a flu vaccine 5 consecutive times increases a persons chances of getting Alzheimer’s Disease 10 times more likely than someone who hasn’t got vaccinated. The Thimerosal contains mercury that causes brain injury and autoimmune injury. The aluminum is associated with Alzheimer’s Disease and seizures, and Formaldehyde is a hazardous waste that causes cancer. I’m not telling you to not get the flu vaccine. But, just stating that it is important to investigate the vaccines we get and understand that not all of them are as effective as we have been told. As well we don’t know what are in these vaccines and we should know what is going in our bodies. Our bodies are important we only get one and its where we live. How important is where you live to you??? If you have a knife stuck in your hand, is it more effective to take out the knife and then fix the wound, or to leave the knife in and treat the pain? I hope you chose the first answer! Unfortunately, in our society we, as well as medical providers, often choose to metaphorically leave the knife in and treat the symptoms instead of treating the problem. So why do we stay sick? Why does back pain keep coming back when commercials for “all-day pain relief” medications promise relief? Why do we keep getting sick after taking medications? It’s because we are choosing to “leave the knife in.” If you have back pain, don’t cover up the pain with a medication, find out what the problem is and fix the problem, don’t just treat the symptom! So many times it really is that simple, whether you suffer from back pain, shoulder pain, neck pain, tiredness, headaches…I could go on and on! All of these things result from a problem that is going on in our body, it doesn’t take rocket science to figure that one out. So why then does it make any sense to leave the source of the problem and only focus on the symptom? Take this way of thinking home with you for any health problem you have. Make smart decisions for your own health, and always find a HEALTH care provider who will help you find and treat problems, instead of a SICK care provider who will help you treat the sickness that is resulting from the problem. Sleep, why do you elude me so? Sleep, a topic near and dear to my heart is the topic I have chosen today. Many of us find ourselves never getting quite enough of the sweet deep refreshing sleep we seemed to get as children. We search for it everywhere from holistic approaches to prescription drugs. As Americans and professionals we are especially prone to finding ourselves in debt to many creditors, the first of which turns out to be our bodies for all the sleep we keep cheating it out of each week. I know because as I write this it is past a good normal bed time which I should be keeping but as much as I try 12:20/1 am sees me all too often. We are on way too friendly terms since college and as much as I have tried I have not found a way to get my 8 hours in consistently since before high school. My search for a better nights sleep has taken me many places and taught me many things. Many of which are in the following article which shows the research in a much more clear and concise way that I can thus I have included it. However I can say from experience many of the techniques and advice found in the article I know to be good and true. I must add however that the best thing you can do to help your body repay its sleep debt is relax sooner after getting home and not try to fight sleep so hard but let it take you as it will. Cover your charging lights for all the technology that clutters your room, keep a bottle of water by your bed, get comfy and go for it. Set a sleep schedule like a work schedule and stick to it and you will find some good sleep in your future. Calm your body and your mind will follow, whither its foam rolling, massage or an adjustment, calm the body and you will be able to sleep much easier. Throw in a better diet not too close to bed times and add a good hard workout to your day and you won’t be able to stop sleep from taking you with it. I hope you all learn from this article as much as I did. Spray Pesticide on an Apple and it’s no longer Organic. Add a drop of oil to a glass of Spring Water and it’s no longer pure. Most Americans detest the idea of dumping chemicals in a pristine, natural environment. But why not the same aversion when it comes to getting the flu shot? Maybe it’s because you don’t realize what’s in it: MERCURY ( a known neurotoxin in the form of Thime-risol), GLYCOL ( a component in antifreeze) and FORMALDEHYDE (the stuff they preserve cadavers with). If you dumped those chemicals in your local water supply you’d get arrested. But every year, unknowing Americans line up at their local pharmacy to get this stuff injected into their veins. 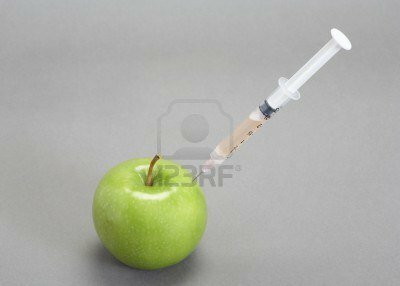 Given the choice to eat an organic apple vs. one blasted with toxic chemicals, you know which one you’d rather take a bite out of. Question is, would you take a bite out of yourself after getting injected with the ingredients in the flu shot? There are natural, alternative ways to boost your immune system and protect yourself from the flu. Ask one of our team members here at HealthSource of Chattanooga about the alternative ways you can keep your body ORGANIC this season! In today’s world we are starting to realize that our health is going down hill. We are smarter and more advanced than any humans that have came before. There have been more inventions in the last 50 years than in all of previous history combined. WOW, we are great. Then why are we less healthy than ever before? We take care of our brains, but not the vessel that it is carried in. As a society we have become more sedate and much less active. Watching TV to catch up on the days events and reality shows outweigh our desire to get off the couch and exercise. With laziness comes laziness. So, is shortening our lives and decreasing the quality of our lives the worst thing we are doing? NO! We are showing our children that health is unimportant. When they see us laying around watching tv, snacking on potato chips and endlessly growing. We are showing that it is okay to be lazy and sick. That IS the worst thing we are doing. We are raising the first generation in modern history, where our children will not live longer than their parents. It is our responsibility to teach our children to be smarter and wiser than we are. Do we remember what it was like to be outside until dark playing? When we were mad that our parents made us come in for diner? Do we remember playing tag or hide and seek with our friends? Do we even remember walking to the mail box without breathing heavy? Why are we letting our children miss those memories? Don’t we want to see our children run, play and laugh? It is such a joy to watch our children play, and we are letting that happen. Playing video games and having muscular thumbs really doesn’t make a healthy child. This is not a blog to accuse anyone of not taking care of their children, it is just asking that we wake up to what is happening. Spending an hour a day playing with our children could ” NO WILL” make all of our lives better and more enjoyable! Thank you for reading.